We are pleased to announce that The Toma Fund has been chosen as the main charity to benefit from 12 months of support and fundraising. Toma Fund is a charity which helps children, teenagers, young people and their families in the North East and Cumbria who have been affected by a diagnosis of childhood cancer. Last year, our support of NSPCC North East saw just under £10,000 raised by our people through a variety of fundraising activities. We now hope to build on this success with Toma Fund, which is based in Gateshead. Hugh Welch, Senior Partner at Muckle LLP who co-ordinates the firm’s CSR activities said: “Our Charity of the Year is selected by our people who suggest local charities or good causes they would like to support. The Toma Fund received the majority of votes in a firm-wide selection process so individuals from across the firm will now become involved in making a real difference for them in the year ahead. Andrea Thompson, the Toma Fund founder, along with Catrina Flynn, the charity’s Development Manager visited our office in Newcastle to meet everyone and help launch our year of support by explaining the importance of the charity’s work. She explained that the fund began when her son, Jordan, became ill with Leukaemia and he wanted to do something to help others like himself who were going through treatment at Newcastle’s RVI hospital. Through Jordan’s efforts and later those of his family and friends, when Jordan unfortunately died, the Toma Fund raised more than £400,000 towards the support and construction of a dedicated unit in the RVI for teenagers living with cancer. Andrea said: “The Toma Fund is a local independent charity that offers practical and direct help to families as they support a child through their cancer battle. We couldn’t do what we do without the help of the community and our supporters have raised money in a whole host of ways. Their generosity has been amazing. 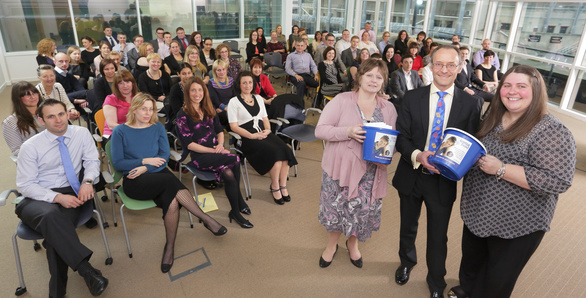 It is fantastic that Muckle LLP has chosen to fundraise for Toma Fund throughout the year ahead. To kick off the fundraising, the people at Muckle LLP each donated money to Toma Fund in exchange for the chance to win a ‘duvet day’ – an extra day’s paid holiday. This was won by Chartered Legal Executive, Gillian Dunn. Hugh Welch said: “The duvet day draw has got our fundraising off to a great start – our people raised £435, which was matched by the firm’s Community Fund, raising £870 in total towards our target of £12,000. We have a host of activities being planned throughout the next 12 months to help the Toma Fund make even more tangible improvements to young people’s lives across the North East. For more information on our CSR activities please contact Hugh Welch on 0191 211 7903.